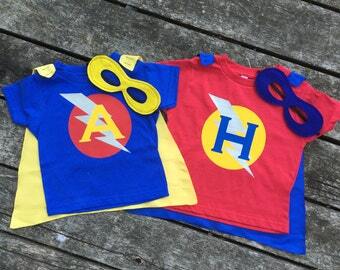 This Custom 3-Peice Superhero T-Shirt, Cape and Mask Set makes a perfect birthday gift, or a great outfit for comfy everyday superhero wear. Bring out the imaginative play in your child with this custom made set, personalized with any color combination and initial you choose. 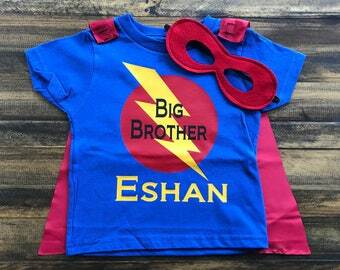 This listing features a Superhero T-Shirt with matching satin cape and coordinating reversible mask! Ultra soft velcro attaches/detaches cape on shoulders of shirt. T-Shirt can be worn alone, then quickly accessorized when duty calls. Reversible felt mask features two coordinating colors, with elastic sewn securely into mask. I use earth friendly Eco-fi felt, which is made from recycled soda bottles. 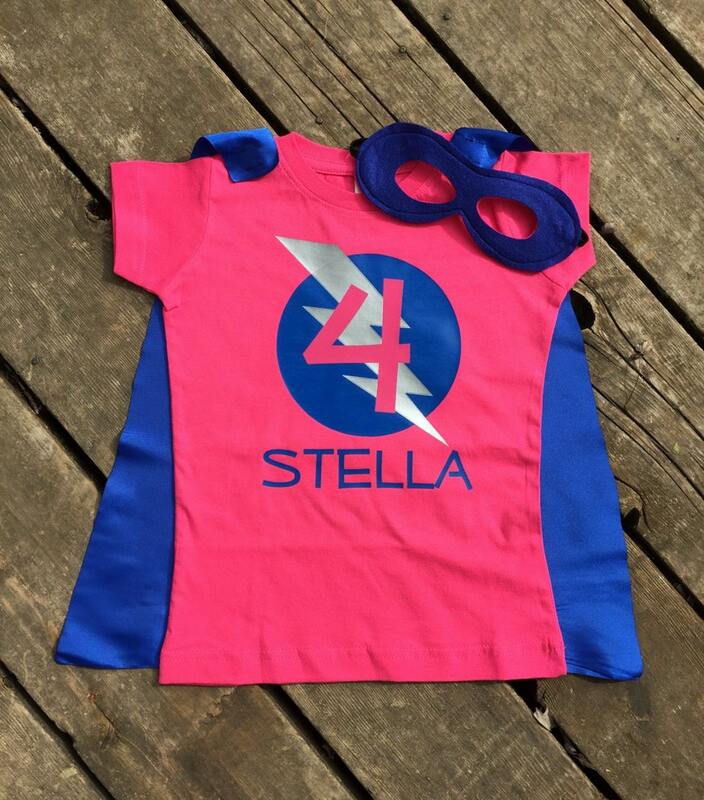 -Pink Shirt with Royal Blue Circle, Silver Bolt, with Pink "4"and Royal Blue "Stella"
-Royal Blue Cape with Pink Circle, Silver Bolt, Royal Blue "4" and Pink "Stella"
Hot Pink, Glitter Pink, Purple, Glitter Purple, Silver, Gold, White, Black, Red, Yellow, Turquoise, Royal Blue, Orange, Green. Black, Red, Royal Blue, Silver, Orange, Dark Green, Turquoise, Hot Pink, Purple. Royal Blue, Turquoise, Black, Silver, Red, Hot Pink, Purple, Light Purple, Dark Hunter Green, Yellow, Gold, White, Orange. Please Note: Logo material is commercial grade vinyl, design is the property of Just Kid'n! Designs LLC, T-Shirt vinyl is applied with a professional grade heat-press and will not come off.